Most window and door companies in the Seattle area offer approximately the same warranty. That’s because most windows come with a warranty. It’s industry standard. Most window manufacturers warranty their products. Most window installation companies do not. When they do, their warranty is generally for a year. And that’s a problem because most window installation issues take longer than a year to get bad enough for you to discover them. When there is an installation problem – and no installation warranty – the labor costs can end up costing more than the windows did. So even when there is an installation warranty, you need to read the fine print. We do things differently at Signature. 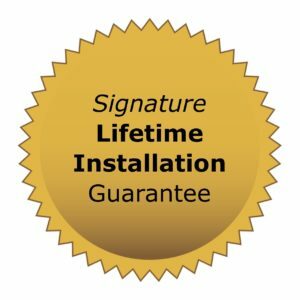 As far as we know, we are the only window and door company in the Greater Seattle/Puget Sound region that offers a FULL LIFETIME WINDOW AND DOOR INSTALLATION WARRANTY. That’s on top of the manufacturer warranty. As long as you own your home, you’re covered for materials, labor, and glass breakage on windows and doors installed by Signature. No other Seattle window company warranty even comes close. For peace-of-mind window installation, call us at 253-887-7792.